The ENA Series covers the frequency range of 300 kHz to 8.5 GHz, and is available in 2, 3 and 4 port models. The PNA-L Series offers the key features of the RF PNA and is code-compatible with the RF PNA. The PNA-L Series covers the frequency range of 300 kHz to 50 GHz, and is available in 2 and 4 port models. 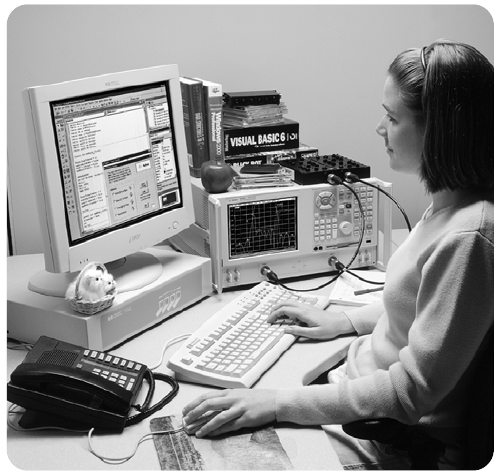 The Agilent E8357A vector network analyzer is a member of the PNA Series network analyzer platform and provides the combination of speed and precision for the demanding needs of today's component test requirements. The PNA Series meets this testing challenge by providing the right combination of fast sweep speeds, wide dynamic range, low trace noise and flexible connectivity. The E8357A provides TRL/LRM calibration (four-receiver enabled) for in-fixture and on-wafer devices, standard bias-tees for active devices and standard direct receiver access for extended dynamic range.